An Egyptian-French mission at the Tell el-Samara site in the Delta governorate of Daqahliya has recently uncovered one of the oldest villages ever discovered in the Nile Delta. The joint mission excavated the remains of a Neolithic settlement, whose occupation lasted until the 2nd dynasty (ca. 4200-2900 BC), at the bottom level of the El-Samara site, . “Discoveries from the Neolithic period are virtually unknown in this area, so this finding is of the upmost importance,” said Frederic Geyau, the head of the mission. The only other settlement discovered so far from the Neolithic period is the town of Sais, which was excavated by the Egyptian Exploration Society. The significant amount of data collected at Tell el-Samara since 2015 provide a unique opportunity to gain a better knowledge of the prehistoric societies living in Lower Egypt a thousand years before the 1st dynasty. 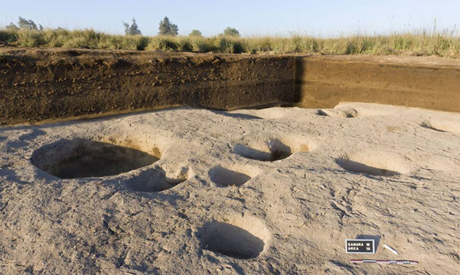 From the pottery and artefacts found at the site, researchers believe that communities settled in the wetlands of the Nile Delta as early as the end of the 5th millennium BC. Ayman Ashmawi, the head of the ancient Egyptian antiquities sector, told Ahram Online that the mission has also discovered a dozen silos containing a sizable quantity of animal bones and botanical remains, which will allow for scientists to study the subsistence strategies of these populations. He also said that the analyses of these organic remains will use cutting-edge technologies and, in conjunction with uncovering the unexcavated areas in the seasons to come, will definitely provide critical insights on the first populations of the Nile Delta, as well as providing insight into the origins of agriculture and husbandry in Egypt.